When considering to buy a streaming device for the TV, a lot of people may have a hard time to decide between Chromecast and Amazon Fire TV Stick. Both gadgets share the similar form factor, share the similar price (less than $40). Both are from reputable tech companies. It is usually not helpful to read reviews for these two products. It is all about your needs: what do you want to do with the HDMI Stick? This guide will try to help you decide which one is suitable for YOU: Chromecast or Amazon Fire TV Stick? I have no intention (possible?) to make judgment on which one is better, because the better one is not always suitable for you. What you need is Mr. or Ms. Right. Chromecast and Amazon Fire TV Stick have a similar size and weight. They both need external power through a Micro USB port. They both must be inserted into an HDMI port in the TV. They both can turn your TV into a connected entertainment device. Amazon Fire TV Stick is a standalone product with its own remote control (although you can control it from your Android or iOS devices as well). Chromecast requires an app on other devices to initiate and control it. Amazon Fire TV Stick is limited by the apps that can be installed on the stick. Chromecast is limited by apps that support Chromecast. These apps are installed on other devices. Amazon Fire TV Stick can be used as a Miracast dongle to mirror the screen of your mobile devices that support Miracast (wireless display). Chromecast supports screen mirroring (screen casting) for Android devices with KitKat 4.4.2 or later. Amazon Fire TV Stick is based on Android OS (ironically). Chromecast is based on Chrome OS. Chromecast has gradually become the unarguable leader in media stream gadget market since its release in July 2013. Even Roku is trying (but fails) to catch up. Chromecast is a game changer for video streaming hardware market. Chromecast support becomes one of the standard for online video streaming. In addition to internet streaming, Chromecast also has some nice features for mirroring local devices and streaming local contents. Compared to Amazon Fire TV Stick, Chromecast offers 3 obvious advantages. Advantage of Chromecast #1. Chromecast is supported by so many apps and works on almost all platforms. A lot of people, especially people who never tried Chromecast, complained about the lack of a dedicated remote control for Chromecast. This is a wrong proposition. Chromecast is unique because it can “attach” to many apps on many devices. You control it from your familiar apps on the familiar devices. You don’t need one more remote control. No other competitors offer such an option yet. This makes Chromecast a truly gadget that is platform independent, and hardware independent. You can enjoy many new things without upgrade your Chromecast every one or two years. If you check the apps that officially support Chromecast in the Chromecast ready apps page, you will be surprised that the 1.5-year-old gadget has got so broad support. Streaming local contents on all your devices is another advantage of Chromecast. For Amazon Fire TV Stick, you have to install a media player app, which may be not convenient to access media files in other devices. For Chromecast, you can stream local contents directly from most device. So, Chromecast gives you more choices for files (movies, music, photos…) saved in your hard disk, USB drive and mobile devices. In addition to video streaming, Chromecast also allows you to cast a Chrome tab from a PC/laptop to the TV. You will find this is useful when you want to show something cool in the internet or to show your Google drive contents to your guest. Another unique feature of Chromecast is the desktop sharing. You can share the desktop of your PC/laptop/Chromebook to the TV. Although this desktop sharing is still an experimental feature, it works reasonably well for presentation, and software demonstration when a projector is not available. It can also be used for audio and video streaming, but video streaming through desktop sharing is not recommended (see this post for the comparison of 6 different methods for streaming local media through Chromecast). Android screen mirroring is the most welcomed feature of Chromecast. Android screen mirroring (Google likes to call it Android screen casting) makes your TV a second display of any Android devices with KitKat 4.4.2 or later. Just FYI, according to Android Platform distribution, by the end of January 31, 2015, KitKat and Lollipop command more than 40% of Android devices. This percentage is growing day by day as Lollipop update will reach more and more devices in the 1st half of 2015. Android screen mirroring was announced in Google I/O 2014. Initially only selected devices got Android screen mirroring support. Last December, this feature was rolled out to all Android devices running KitKat 4.4.2 or later. Please read this post and this post on Android screen mirroring. Why is Android screen mirroring a big thing? Because Android screen casting can bypass the Chromecast support of individual apps, you will be able to enjoy all of the Android apps (of course, including games) on the big TV screen without waiting for the developers to add Chromecast support. Such a feature is still a daydream for iOS or Windows Phone owners. 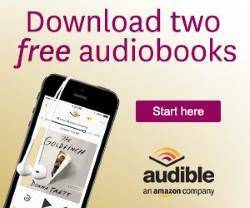 Amazon is probably less forward-thinking in hardware compared to Google, but they do provide you the best value you can get for the hardware: Kindle eReader , Fire tablets and the Fire TV. Amazon Fire TV Stick is a shrunk version of Fire TV. It has all features of Fire TV except the FreeTime, optical audio output and Ethernet port. In the streaming hardware market, many analysts believe Amazon Fire TV stick is an underdog in the shadow of Chromecast. But this may be not true if you truly understand the advantages of this tiny Fire TV Stick. If you are a Amazon Prime member , the Fire TV Stick gives you the insane value for your 39 dollars. Actually, if you pre-ordered it last year, you could even get it at just $19. With the stick, you can instantly access all Prime videos which are included in your $99 Prime membership. The Prime video collection may be not as impressive as that of Netflix or Hulu Plus in quality, but the collection is growing far faster than the other two, especially with the inclusion of HBO titles. Of course, Prime also provides unlimited Prime music and free 2-day shipping. Now, with the $39 Fire TV Stick , you can enjoy these Prime videos and Prime music easily. No other devices can provide such a high value if you are a Prime member already or plan to join the party. Advantages of Amazon Fire TV Stick #2: Fire TV Stick is a standalone gadget even your grandma can use it easily. Amazon Fire TV Stick is a standalone product with its own remote control. You can just image it as a new DVD player. This simply means your grandma can use it easily. Of course, Amazon released the Fire TV app so that you can control the Fire TV Stick from your mobile devices if you want. You can also pair an Amazon Fire Game Controller to the Stick for some simple games that installed from Amazon App store. But do not expect it to replace your $400 game console. If your TV does not support Miracast (please read this post if you want to know the difference between Chromecast and Miracast), but you want to mirror a Miracast-enabled mobile device to the TV, Amazon Fire TV Stick can be your life-saver. In other words, Fire TV Stick can also be used as an more expensive Miracast dongle. So, it is not necessary to get a Miracast dongle if you have the Fire TV Stick. I am not sure why Amazon never advertises this feature. Anyway, if you are planning to buy an inexpensive Miracast dongle, Fire TV Stick is a better deal. It is a touch question whether you should get a Chromecast or the Amazon Fire TV Stick, because it all depends on your needs. In addition to the 3 advantages of Chromecast and Amazon Fire TV Stick mentioned above, you may check the 5 following questions to give you better idea. 1. Chromecast VS Amazon Fire TV Stick: Are you a Prime member? If you are a happy Amazon Prime member, Fire TV Stick is a good option and will make you happier. The free Prime Video and Prime Music gives you the best additional value for your Fire TV Stick. 2. Chromecast VS Amazon Fire TV Stick: Is it a gift for your grandma? If it is a gift to your grandma or other less techy people, Fire TV Stick is a better option. They will enjoy more with the Fire TV Stick. Fire TV Stick is simper to setup and use, although Chromecast is not that complicated. 3. Chromecast VS Amazon Fire TV Stick: Are you a customer of Netflix or Hulu Plus and satisfied with their collections? If you are a happy customer of Netflix or Hulu Plus, Chromecast may be a better choice. Although Netflix or Hulu Plus work on both Chromecast and Fire TV Stick, Chromecast may add more value for you through desktop sharing, Android screen mirroring, and more app options. 4. Chromecast VS Amazon Fire TV Stick: Do you own any Android devices with KitKat 4.4.2 or later and use them frequently? You can use the device screen when working or on the road, and switch to TV when at home. The Android screen mirroring gives you many options. For example, the games you can play is limited by the Android device you are using, not Chromecast. 5. 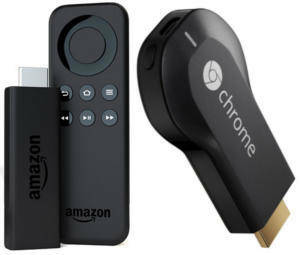 Chromecast VS Amazon Fire TV Stick: Are you planning to buy an inexpensive Miracast dongle? If you are also planning to buy an inexpensive Miracast dongle, Fire TV Stick is surely a better deal. With Fire TV Stick, it is not necessary to buy the cheap Miracast dongle. What’s your decision or thoughts on Chromecast VS Amazon Fire TV Stick? Please leave your comments or questions on Chromecast VS Amazon Fire TV Stick in the comment box below. We can discuss about them. If it is a question, we will try to find an answer for you. For other Chromecast questions or problems, please check our Chromecast How-to Guides page. Hi, if I’m gonna get the Chromebit when it comes out, will it have all Chromecast functionalities built in so I only need to buy 1 device: the Chromebit? Chromebit uses the TV (or any monitor with HDMI input) as output. It is a portable PC. Communication between Chromebit with other mobile device is still an issue now. Although Chrome OS can run a few Android apps, most apps and games cannot run Chrome OS (Chromebit) yet. So, I don’t think Chromebit is a replacement for Chromecast currently. But in long term, Chromebit-like device will vry likely replace Chromecast. Chromecast is based on the same OS as Chromebit (Chrome OS). (SAME asker again) But until Chromebit comes out, is there any way I can mirror my Developer and Pure Editions respectively onto either TV or front projector using some sort of PHYSICAL connection/cable/adapter (running 4.2.2 & 5.0, NO home Wi Fi, no Chromecast yet)? Trying to go for simple solution AND cheap! No fancy solution! If your TV support Miracast, you can use wireless display on Moto X to mirror the screen. Miracast does not require a router.